We carry the largest selections of Historic Replica Helms and helmets on the internet! 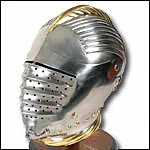 From Dark-age, Roman, Viking, Norman, Medieval and Renaissance Helms as well as SCA and WWII Helmets. All our Helmets have Migrated up to the Armor Section! This category is currently empty. Please check back soon for new Products. Copyright © the-larp-store.com 2019. All Rights Reserved.